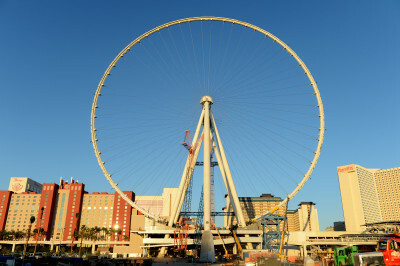 Home » The High Roller Update – Its Huge. New pics from today, October 14, 2013. The final struts holding the structure up are being removed. The massive las vegas ferris wheel (or observation wheel as Caesars likes to call it), can be seen from basically anywhere on the strip – Yes, it towers over every hotel! The High Roller is the center piece to The Linq, the $550 million outdoor entertainment and dining district, which is slated to open later this year. The High Roller Seen from behind the Strip. Massive!